When I noticed that a restaurant was in the works for 700 Fifth, I did a little idle Google searching for past businesses at that address. You never know what results Google will spit out, and this time it came up with the altogether prosaic, dull-to-the-point-of-compelling trade paper Shoe Retailer & Boots & Shoes Weekly, Vol. 72, (August 1909). 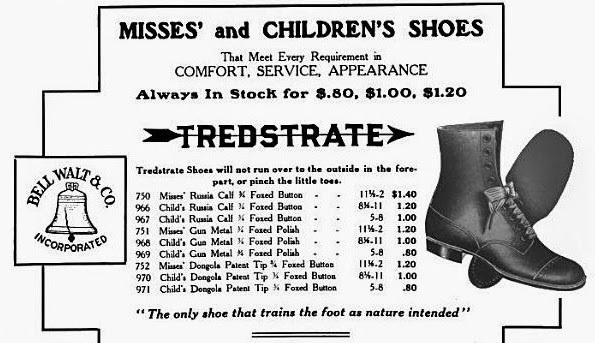 Based on a report on local Brooklyn stores, I learned that a century ago there were at least fourteen shoe retailers between 10th and 22nd on Fifth. Granted, at least one of these was a department of a larger store, but still, that's a lot of shoes. Today, on the same stretch of Fifth, there are just four five: Payless, Windsor World of Shoes, Bobby's, Fabco, & Foot Locker. The shoe store locations of 1909 are now occupied by the upcoming restaurant at 700, the Hellenic Charter School, the Prospect Expressway, the CNS Hardware Store, an apartment building, a Subway, a 99c store, a bank, Bicycle Habitat, Rite Aid, & Windsor World of Shoes. Yes, it's up to Windsor, a comparative newcomer on the avenue (though a longtime presence in Windsor Terrace) to revive shoe history at 484! 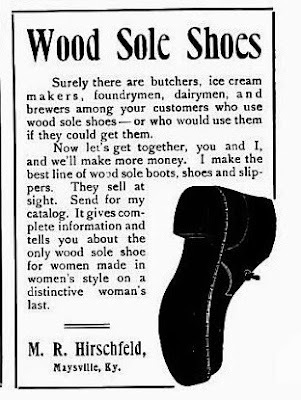 Apparently August of 1909 spelled a period of "seasonable dullness" in the shoe trade. Business was quiet. Samuel Bloomberg (638) "had not accomplished wonders in the way of profits," and the report for 462 Fifth - its sub-heading, Bought Only Staples for Fall - was equally cheerless. Several stores employed incentives to encourage potential customers, with premium ticket prizes (tea spoons, cigar jars, cut glass) for set levels of buying. Other business & personal events were recorded. According to the Retailer, M.R. Sorenson, at 574, had come to the States from Denmark in 1883, & shoemaking practices in the two countries were quite different. New tungsten lights at the Douglas store (478), a death in the family at Hadfield's (476) and vacation plans at Ruhman Regal Store (466) also made the news. While the prose in Shoe Retailer & Boots & Shoes Weekly is as stodgy as it gets, the ads. 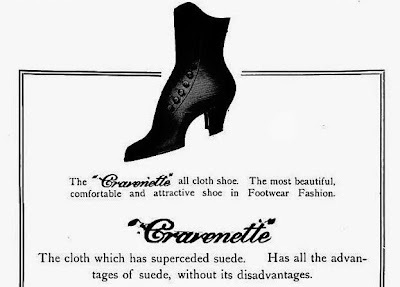 are another matter altogether, and will make you quite depressed about the footwear of today. Consider the poetry of genuine calf tops, pearl & ivory shoe buttons, boudoir slippers and Mayfair patents. 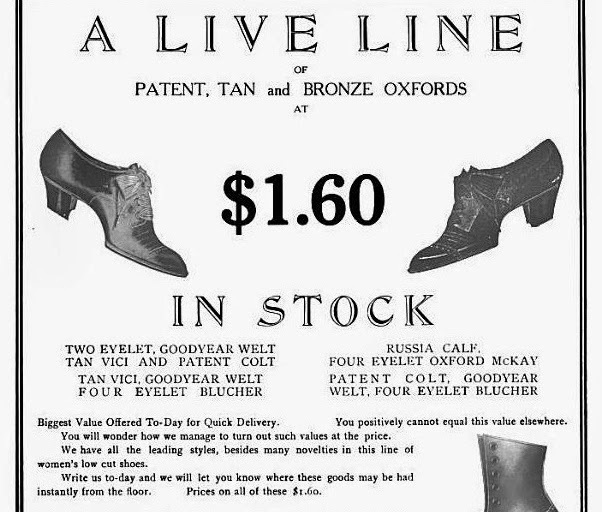 Dream too, of H.F. Volquardsen's Wood Sole High Cut Shoes with Klondike Eyelets & Rawhide Laces, Blucher Lace Short Vamps, John Kelley Dainty Shoes, & Spenceria Shoes for Men who Work. 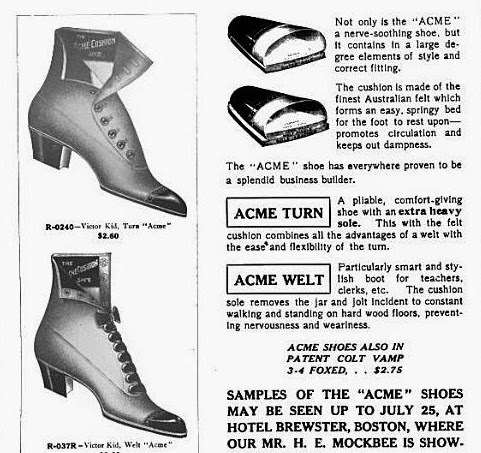 The Moulder's Original Asbestos fire-resistant shoe sounds a little scary, and the S & M Shoe for Men sounds pretty exciting, though in actual fact the latter is just a Slater & Morrill style. Oh well - the shoes on display in the pages here are still thrilling. 525 - Thomas Garvey - "considered one of the landmarks of this rapidly growing section"